Search Databases: Cochrane Library, CINAHL PLUS with full text, Medline with full text, Proquest, Google Scholar. Search dates: 10/25/10-11/13/10. Total shoulder arthroplasty, or TSA, is a procedure used to replace the diseased or damaged ball and socket joint of the shoulder with a prosthesis made of polyethylene and metal components. The “ball” is the proximal head of the humerus and the “socket” refers to the concave depression of the scapula referred to as the glenoid. A reverse total shoulder arthroplasty, or rTSA, refers to a similar procedure in which the prosthetic ball and socket that make up the joint are reversed to treat certain complex shoulder problems. The first record of shoulder arthroplasty was performed in 1894 by the French surgeon, Jean Pean. The original implant consisted of a platinum and rubber implant for the glenohumeral joint. Charles Neer is credited with the advancement of modern TSA, developing more modern prostheses for surgical procedures beginning in the 1950’s. There are approximately 23,000 shoulder replacement surgeries performed each year compared to 400,000 knee replacements, and 343,000 hip replacements. This is largely due to the relative complexity of the anatomy and biomechanics of the shoulder joint. Because of the complexity of the region, there are multiple variations in prostheses and surgical procedures that are performed depending on the tissues that are implicated. Since Neer’s initial design in 1951, more than 70 different shoulder systems have been designed for shoulder reconstruction arthroplasty. The earliest shoulder replacement procedures were limited to treating proximal humeral fractures, but current implications for shoulder arthroplasty include: primary osteoarthritis, posttraumatic arthritis, inflammatory arthritis, osteonecrosis of the humeral head and neck, pseudoparesis caused by rotator cuff deficiency, and previous failed shoulder arthroplasty. Understanding the different prosthetic options and indications for each impairment is important for all practitioners in the health care continuum. Algorithms have been developed to assure each patient is matched with the correct procedure and fitted with the right prosthetic option. Below are examples from Wiater and Fabing detailing the method for selecting the proper procedure. There are 3 main categories of shoulder reconstruction surgery: Hemiarthroplasty, total shoulder arthroplasty (TSA), and reverse total shoulder arthroplasty (rTSA). Hemiarthroplasty involves the humeral articular surface being replaced with a stemmed humeral component coupled with a prosthetic humeral head component. Hemiarthroplasty is indicated when either the humerus alone is implicated, or the glenoid is not fit to support a prosthetic. Indications include: arthritic conditions involving both the humeral head and osteonecrosis without glenoid involvement, however the most common indication for this procedure are severe fractures of the proximal humerus. An optional technique is a resurfacing hemiarthroplasty that does not require a stemmed component inserted into the long shaft of the humerus, rather the humeral head is simply resurfaced with a prosthetic component. This procedure has proven effective at managing arthritic conditions of the shoulder and is favorable for young, athletic patients with worries of loosening prosthetic components. In TSA, the current components of the glenoid are either a pegged or keeled high-molecular weight polyethylene cemented component. These become fixated by allowing bony ingrowth through the pourous ends of the component. For some shoulders with inferior bone quality, metal backing is used to increase the durability and fixation of the polyethylene component. Controversy still exists as to the stress effects metal backing can potentially cause on the joint. The humeral component consists of the artificial metal humeral head attached to a metaphyseal stem that is either fully cemented, proximally cemented, of press-fit into the humeral shaft. Harris et al. Found no difference in comparing micromotion between fully and proximally cemented techniques. Indications for TSA include: osteoarthritis, inflammatory arthritis, osteonecrosis involving the glenoid, and posttraumatic degenerative joint disease. The patient must also have an intact rotator cuff complex, or else other prosthetic techniques would be implicated. A prospective study by Barrett et al. found that 47 or 50 patients treated with TSA had significant decreases in pain and increases in range of motion compared to presurgical measurements. A 2004 study by Collins et al. compared conventional TSA with Hemiarthroplasty and although both groups showed significant decreases in pain from pretreatment measurements, the TSA group demonstrated more increases in ROM. There are several variations to the TSA procedure. Resurfacing total shoulder arthroplasty involves replacing the deteriorated bone surface of the humeral head and does not require a stemmed component inserted into the long axis of the humerus. Because there is no stemmed humeral component, this technique is becoming a popular option. Levy and Copeland compared cementless resurfacing TSA’s with standard stemmed prostheses and found comparable results. An alternative for the active individual is the TSA with Biologic Glenoid Resurfacing. This procedure involves a TSA humeral component coupled with glenoid resurfacing using a form of biologic tissue (fascia lata, anterior shoulder capsule, Achilles tendon, menisci) and studies have shown comparable results to conventional TSA. Comparison of published studies show some disagreement whether TSA is a superior treatment to hemiarthroplasty for patients with primary osteoarthritis. A meta-analysis by Radnay et al. found significantly greater pain relief, forward elevation, gain in forward elevation, gain in external rotation, and patient satisfaction with TSA compared with hemiarthroplasty in a total of 1,952 patients. rTSA involves a stemmed-humeral component containing a polyethylene humerosocket replacing the humeral head, and a highly polished metal ball known as a glenosphere replacing the socket, or glenoid. One can think of this as the “ball and socket” components being switched. This allows for better fixation of the prosthetic parts and increased stability of the joint. An rTSA currently is indicated for patients suffering from osteoarthritis or compound fractures of the humerus, in conjunction with a deficiency of the rotator cuff complex. Matsen et al. also states that an rTSA should be considered for patients whose shoulder problems cannot be managed using a conventional TSA. Several features make the rTSA more compatible for certain patient populations. The deep concavity of the humeral articular component, as well as the simplicity of the glenoid component, allow for better fixation of the prosthesis and fewer problems with component loosening. Compensation for rotator cuff dysfunction is made with the rTSA that typically is left unmanaged in conventional TSA. Several long term studies have been done on the procedure with positive results. Early studies found both high complication and revision rates, 50% and 60% respectively, however a 2007 retrospective study by Wall et al. found a complication rate of only 19%. The authors of this study also suggest that rTSA can be used for a larger population of patients receiving a shoulder replacement, not just those with rotator cuff arthropathy. Early evidence suggests that RTSA is a viable option for certain patient populations with more research needed in comparisons with TSA and Hemiarthroplasty. Component Loosening-Symptomatic loosening of the glenoid and humeral component represent one third of the complications from TSA. Glenoid Loosening- Most loosening is believed to be a result of aseptic loosening of the cement while new innovations of implants such as press-fit, plasma sprayed, and tissue-ingrowth implants are promising alternatives that could prove to be more stable than traditional cemented implants. Humeral Loosening- Although glenoid loosening accounts for the majority of loosening complications, radiolucent lines of 2 mm or more have been seen in the humeral component and most cases are in non-cemented implants. Anterior Instability- Often associated with malrotation of the humeral component, dysfunction of the anterior deltoid, or disruption of the sutured subscapularis tendon. Most commonly this is the result of poor operative technique, poor tissue quality, inappropriate physical therapy, or the use of oversized components. Superior Instability- Progressive superior migration can be caused by failed repair of the rotator cuff, or a complete tear of the insertion of the rotator cuff, but in a study of 29 TSA’s that had proximal humeral migration, only seven had a tear of the rotator cuff. This suggests that the cause is more likely a muscle imbalance with a strong deltoid and a weak, poorly rehabilitated rotator cuff. This finding helps to stress the importance of strengthening the rotator cuff in a post TSA patient. Posterior Instability- Excessive retroversion of the glenoid component or the humeral component can cause instability in the posterior direction. Asymmetrical wear of the posterior glenoid is indicative of long standing OA and can lead to excessive retroversion of the glenoid component. 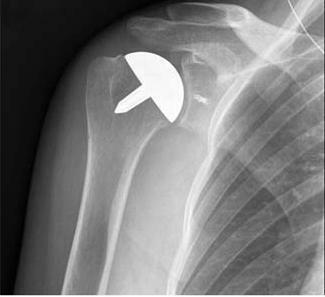 Inferior Instability- Often associated with TSA for proximal humeral fracture, inferior instability can also be seen in patients who have had TSA to treat prosthetic revision, chronic fracture, previous osteosynthesis, or uncomplicated RA or OA. Restoration of humerus length and the proper tension of the deltoid will amend the instability. Rotator cuff tears- Third most frequent complication of TSA. Both operative and non-operative treatments have been used, although benefits of operative treatment is unclear. Fractures- Periprosthetic, intraoperative, and postoperative fractures can delay postoperative rehabilitation. Infection- A rare but potentially devastating complication, most cases are associated with risk factors such as diabetes mellitus, RA, systemic lupus erythematosus, and previous operations on the shoulder. Neural injury- Neuropraxias are most common and can be treated with non-operative treatment, often yielding good results. Prosthetic Complications- Occasionally complications of the implant such as dissociation of the polyethylene glenoid insert from the metal backing or fracture of the keel insert can occur. Deltoid Dysfunction- Earlier procedures removed the deltoid from its origin. Today’s more common deltopectoral approach doesn’t disrupt the attachment of the deltoid, resulting in less atrophy and denervation complications. Patients will be in a shoulder immobilizer during the day for the first week and at night for the first month, following a deltopectoral interval approach. Four weeks following the surgery, patients will be in a shoulder sling. In cases of certain approaches where the deltoid is removed from its attachment, precautions will vary depending of which part of the deltoid was cut as well as the general quality of the soft tissue. In the first few days following rTSA flexion/elevation in the scapular plane can be done passively up to 900, but pure abduction is contraindicated as it places stress on the anterior structures of the shoulder. Internal rotation is also not recommended for the first 6 weeks postoperatively to prevent dislocation. Much like the traditional TSA, the rTSA patient will be in an abduction sling/immobilizer for 3-4 weeks after surgery. In both traditional and reverse TSA, postoperative precautions and the progression of therapy will be dictated by the surgeon depending on the quality of bone and soft tissue as well as any considerations due to complications around the operation. Overall recovery from total shoulder arthroplasty may take up to 1 to 2 years. To date, there is limited evidence detailing any postoperative rehabilitation programs. Those that are available usually consist of a progression from passive to active range of motion, later on incorporating progressive stretching and strengthening. The progression of the patient through the phases of rehab must be continually modified based on their underlying pathology and clinical presentation. Many protocols will present with timeframes between phases which should only be used as a guideline for the patient. The physical therapist should continuously work alongside the referring surgeon in developing each patient’s specific rehabilitation protocol, with the focus on meeting certain impairment and functional criteria before progressing on to the next stage. Patient education before and after the surgery is vital as patients must know to expect differing levels of postoperative function depending on many factors such as the type of surgical implant, status of the remaining rotator cuff, and bone stock of the glenoid and humeral head. Numerous outcome measures can be used to assess the patient throughout the course of rehabilitation. Some of the more commonly used measures are the Constant Score, Simple Shoulder Test, and ranges of motion. These can be used to assess patient status and progress them through varying phases of rehabilitation. The following is an outline by Wilcox et al. detailing a 4 phase program for postoperative rehabilitation following total shoulder arthroplasty. Click on the thumbnail to look at Wilcox protocol. Reverse shoulder arthroplasty is a technique gaining wide popularity that requires a somewhat different postoperative rehabilitation protocol with its own precautions. Boudreau et al. stresses 3 key concepts to keep in mind when developing a postoperative rehabilitation protocol: Joint protection, deltoid function, and establishing appropriate functional and ROM expectations. With the rTSA, there is higher potential for instability, therefore the patient must avoid placing the surgical arm in internal rotation and adduction with extension for at least the first 12 weeks. The deltoid will become the prime mover in shoulder elevation and its strength and recruitment is critical for eventual functioning of the involved extremity. Lastly, functional return and ROM will vary case by case depending on numerous pre/post surgical variables and the expectation of the level of functional return must be discussed with each patient. Boudreau et al. offers an extensive protocol along with their article that can be accessed through the Journal of Orthopaedic and Sports Physical Therapy. Many factors have an impact on the outcomes of the postsurgical patient; they include preoperative health status, preoperative shoulder function, age, gender, and social environment. Longevity of the prosthesis, strength, ROM, patient-reported surveys and patient reports of pain compared to preoperative measures are commonly used as outcome measures when studies are performed. Some studies use the Simple Shoulder Test (SST) to track patient progress. Since there is no universally accepted functional outcome measure for TSA it makes it difficult to compare outcomes across studies. The etiological cause for TSA appears to be the greatest indicator for prognosticating success rates postoperatively. Osteoarthritis: TSA is the most successful option for pain relief and restoration of function in patients with OA who have failed conservative treatment. It also has the largest success rates with most series reporting 90%-95% of patients to be eventually pain-free post surgery. Most of these patients should expect to achieve acceptable functional ROM, defined as 140° of forward flexion. Rheumatoid Arthritis: Although patients with RA might have more complicated surgical procedures, patients with advanced RA can benefit greatly from TSA. A study by Stewart and Kelly concluded that TSA provided reliable long term pain relief with ROM and functional improvements, although outcomes were mainly focused on surgical results such as component loosening. A comparable increase in ROM is not to be expected with RA patients compared to OA and rehab should focus on performing functional activities below 90°, as they may not achieve full overhead motion. Proximal Humeral Fractures: Due to the variability in humeral fractures, it is difficult to establish baseline functional outcome measures for this subset of patients. Various studies have found forward flexion to be between 92° and 102° postoperatively, with a significant decrease in pain. It is important to also consider the underlying fracture type, as this may dictate the following course of rehab. Total shoulder arthroplasty has become a viable option for patients with advanced shoulder dysfunction due to a variety of different etiologies. This procedure, along with the newer reverse total shoulder arthroplasty, can help relieve pain and increase function in patients when indicated. Postsurgical rehabiliation for these patients is key to obtaining successful outcomes. There is currently limited evidence and guidelines regarding postsurgical rehabilitation, therefore each patient should be evaluated on a case by case basis in strong collaboration with the patient’s other healthcare providers. ↑ 1.00 1.01 1.02 1.03 1.04 1.05 1.06 1.07 1.08 1.09 1.10 Wilcox R, Arslanian L, Millett P. Rehabilitation following total shoulder arthroplasty. The Journal Of Orthopaedic And Sports Physical Therapy [serial online]. December 2005;35(12):821-836. ↑ 2.0 2.1 2.2 2.3 2.4 2.5 2.6 Gregory T, Hansen U, Emery R, Augereau B, Amis A. Developments in shoulder arthroplasty. Proceedings Of The Institution Of Mechanical Engineers. Part H, Journal Of Engineering In Medicine [serial online]. January 2007;221(1):87-96. ↑ 3.0 3.1 3.2 Matsen Iii F, Boileau P, Walch G, Gerber C, Bicknell R. The reverse total shoulder arthroplasty. Instructional Course Lectures [serial online]. 2008;57:167-174. ↑ 4.0 4.1 4.2 4.3 4.4 4.5 4.6 Boudreau S, Boudreau E, Higgins L, Wilcox R. Rehabilitation following reverse total shoulder arthroplasty. The Journal Of Orthopaedic And Sports Physical Therapy [serial online]. December 2007;37(12):734-743. ↑ 5.0 5.1 5.2 5.3 5.4 5.5 Keller J, Bak S, Bigliani L, Levine W. Glenoid replacement in total shoulder arthroplasty. Orthopedics [serial online]. March 2006;29(3):221-226. ↑ Shoulder Joint Replacement. American Academy of Orthopaedic Surgeons Web site. http://orthoinfo.aaos.org/topic.cfm?topic=A00094. Accessed November 11, 2010. ↑ 7.0 7.1 Wiater J, Fabing M. Shoulder arthroplasty: prosthetic options and indications. The Journal Of The American Academy Of Orthopaedic Surgeons [serial online]. July 2009;17(7):415-425. ↑ Harris, T.E., Jobe, C.M., Dai Q.G. Fixation of proximal humeral protheses and rotational micromotion. Journal of Shoulder and Elbow Surgery, 2000, 9(3), 205-210. ↑ Barrett W, Franklin J, Jackins S, Wyss C, Matsen F. Total shoulder arthroplasty. The Journal Of Bone And Joint Surgery. American Volume [serial online]. July 1987;69(6):865-872. ↑ Collins D, Harryman D, Wirth M. Shoulder arthroplasty for the treatment of inflammatory arthritis. The Journal Of Bone And Joint Surgery. American Volume [serial online]. November 2004;86-A(11):2489-2496. ↑ Levy O, Copeland SA: Cementless surface replacement arthroplasty (Copeland CSRA) for osteoarthritis of the shoulder. J Shoulder Elbow Surg 2004;13:266-271. ↑ Radnay CS, Setter KJ, Chambers L, Levine WN, Bigliani LU, Ahmad CS: Total shoulder replacement compared with humeral head replacement for the treatment of primary glenohumeral osteoarthritis: A systematic review. J Shoulder Elbow Surg 2007;16:396-402. ↑ 13.0 13.1 13.2 13.3 Wall B, Nové-Josserand L, O'Connor D, Edwards T, Walch G. Reverse total shoulder arthroplasty: a review of results according to etiology. The Journal Of Bone And Joint Surgery. American Volume [serial online]. July 2007;89(7):1476-1485. ↑ Wierks C, Skolasky R, Ji J, McFarland E. Reverse total shoulder replacement: intraoperative and early postoperative complications. Clinical Orthopaedics And Related Research [serial online]. January 2009;467(1):225-234. Available from: MEDLINE with Full Text, Ipswich, MA. ↑ Wirth M, Rockwood C. Complications of total shoulder-replacement arthroplasty. The Journal Of Bone And Joint Surgery. American Volume [serial online]. April 1996;78(4):603-616. ↑ 16.0 16.1 16.2 16.3 Boardman N, Cofield R, Bengtson K, Little R, Jones M, Rowland C. Rehabilitation after total shoulder arthroplasty. The Journal Of Arthroplasty [serial online]. June 2001;16(4):483-486. ↑ Stewart M, Kelly I. Total shoulder replacement in rheumatoid disease: 7- to 13-year follow-up of 37 joints. The Journal Of Bone And Joint Surgery. British Volume [serial online]. January 1997;79(1):68-72.